I'm a member of Thirty Plus, which was created by Hayley from London Beauty Queen and consists of bloggers from all genres who are 30 and over. Blogging is often seen as a 'young' thing, so Thirty Plus is all about recognising and celebrating that there are bloggers out there who are in their 30s, 40s and beyond. You really don't have to be over 30 though, it's not an exclusive club, so you can join if you are younger. If you'd like to read more about Thirty Plus just click on the image in my sidebar. Hayley has gathered together bloggers from around the country to organise events close to them but Hayley herself organises Thirty Plus events down in London. Towards the end of last year Thirty Plus held an event with Avene to take a look at their new PhysioLift range. As I'm based a couple of hours drive from London I can only really afford to travel there for work, so I was unable to attend the event, but I was lucky enough to be sent a couple of PhysioLift products to try for myself. 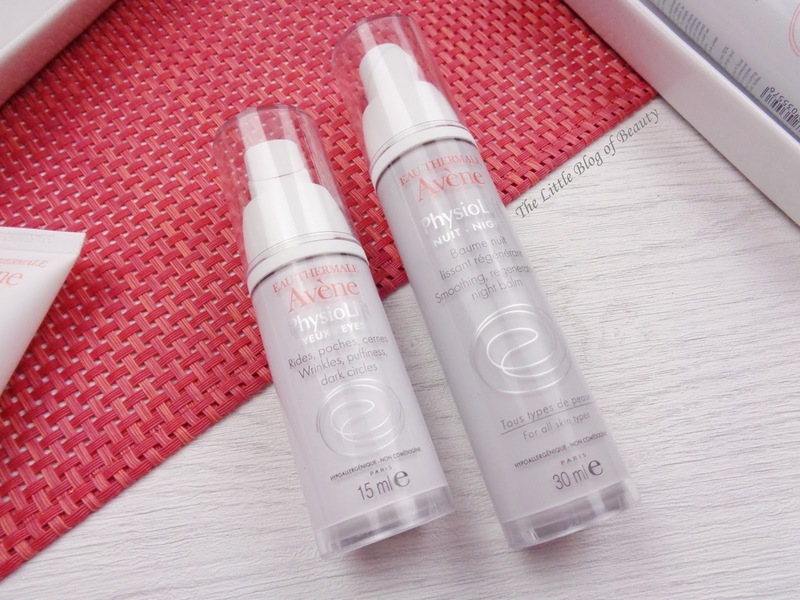 I was sent the Avene PhysioLift Smoothing Regenerating night balm* and Avene PhysioLift eyes*. I've been struggling for so long to try and get a good picture of these bottles but they just don't photograph well unfortunately, or I just don't have the skills! Avene have recognised that anti-ageing products can be harsh on sensitive skin causing irritation, dryness and breakouts. Therefore those with sensitive skin may have to choose between products designed to improve the signs of ageing and those designed designed for sensitive skin. They've addressed this by creating a range of products containing active ingredients that are gentle on the skin. One ingredient in the Physiolift products is retinaldehyde, which is as effective as retinol but less irritating on the skin. This is derived from vitamin A and works to rejuvenate the skin boosting radiance. They also contain hyaluronic acid fragments. Hyaluronic acid is a molecule that holds on to water and 'fills' space within the skin, however to be absorbed to the correct level of the skin the molecule needs to be split into the correct size fragments. This plumps the skin helping to deliver moisture and support collagen. Finally Ascofilline is a collagen-boosting ingredient that is exclusive to Avene. This replenishes the skin, boosting collagen to help skin look plump and fresh. Although I'm approaching my mid-30s now I'm lucky enough that I'm not really starting to show any signs of ageing yet, which I think is due to good genes passed down from my mum. I do get a few lines on my forehead sometimes but this is more due to dehydration and having very expressive eyebrows, rather than ageing. So while I can comment on how these products made my skin feel and look I can't really comment on any effects on the signs of ageing. My favourite product of the two I have from the range is definitely the eye cream. Despite suffering from dark circles that I really wish would disappear I don't always remember to use eye cream because I just haven't really found one that I particularly enjoy using. The only time I really remember is when the skin around my eyes becomes really dry and flaky, which isn't particularly attractive. As soon as I tried PhysioLift eyes I instantly liked it and have gone from maybe using an eye cream once a day if I remembered two using this twice a day religiously. As I've said I don't really have any fine lines around my eyes, so I can't comment on any improvement to lines that aren't currently there, but I just really like how this makes the skin around my eyes feel. It absorbs very quickly leaving nothing behind on my skin and my skin feel smooth and plump. I haven't noticed any improvement to my dark circles but I personally think these are hereditary as nothing ever improves them. Although PhysioLift eyes is my favourite product of the two this doesn't mean I dislike PhysioLift night in any way. This isn't particularly a rich cream, I'd describe it as more of a gel cream, and my skin drinks it up. My skin does tend to prefer gel creams over anything else anyway but this might also be due to those correctly sized hyaluronic acid fragments getting down to where they need to get to. I don't really know enough about this kind of thing to make a call like that. Just like the eye cream this leaves my skin feeling smooth, plump and hydrated and looking good too. One last thing about both products is that although the packaging is a bugger to photograph I am impressed by it. Both products come with a lid and a twist lock on the dispenser and the product is dispensed through quite a small hole that is covered until you press on the dispenser. Not only does this help with not dispensing too much product, you can dispense tiny amounts if you want to, but also helps keep any active ingredients as fresh as possible as no air is getting to them. Overall I'm really impressed with both products and would definitely recommend them and consider purchasing them myself in the future. The eye cream is £22 for 15ml and night cream £26 for 30ml and both are available in Boots stores. Do you use any anti-ageing products yet?